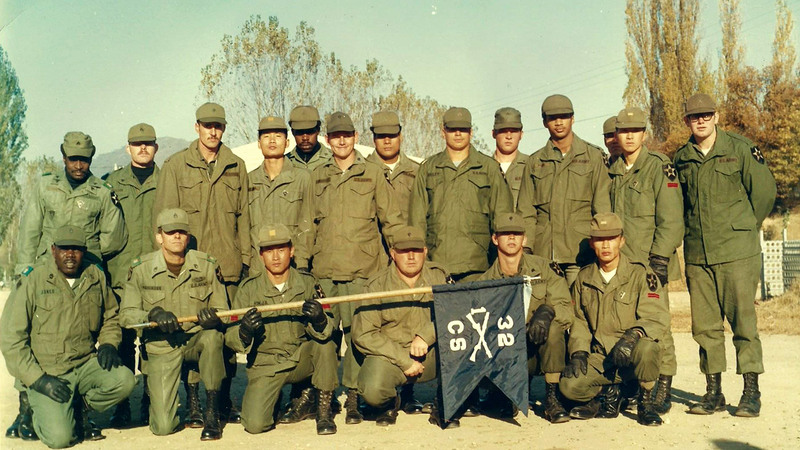 Steve Bailey, (standing behind the flag), is pictured here with his platoon in the 1970s. While he’s called Iowa home for many years, Steve Bailey, environmental services manager at ChildServe, traveled across the world during his years in the military. After graduating from high school in 1973, the last year of the draft, Steve decided to enlist. Basic training brought him to Louisiana, and he went to Georgia for the Airborne Ranger program. When a knee injury in training disqualified him from that program, the next steps on his journey in the military took him to the Demilitarized Zone (DMZ) in Korea for two years. The DMZ serves as the border between North and South Korea, and it’s known as one of the most dangerous borders in the world. When Steve wants to adjust his attitude on tough days, he remembers that he won’t ever have a day as bad as the DMZ again. After two years, Steve returned to Fort Riley in Kansas to drive fuel trucks in 1976. He re-enlisted in 1977 for three more years in the military. Steve experienced things that were difficult to go through. Like many veterans, he doesn’t talk about combat often, and he avoids movies that bring back those experiences and emotions. But being in the military also shaped Steve into the person he is today. Steve celebrated his 25th year of working at ChildServe this fall, and he still sees positive effects from his time in the military in his life today. To Steve and all the veterans at ChildServe, we recognize and thank you for your service and sacrifice!